On giving up another uncanny 3-point performance, and why it’s not time to panic just yet. The Cowboys suffered the second-worse loss in GIA’s 81-season history Wednesday night. Oklahoma State fell to Texas Tech 78-50 in front of what started as 6,155 fans, but that only went down from there. The Cowboys have lost there past six conference games and, at 9-15, have only eight more guaranteed games this season to hit double-digit wins. With those #SadButTrue facts out of the way, here are some thoughts. The scouting report on Texas Tech noted how good the Red Raiders’ defense was. Tech entered the game ranked first in the country in KenPom’s adjusted defensive efficiency, and the Red Raiders were third in the country in scoring defense, allowing only 57.3 points a contest. What wasn’t on the scouting report was Tech shooting 12-of-25 from 3-point range. The 48 percent Tech shot against OSU was the second-highest percentage the Red Raiders have shot in a game this season, something that has been happening a lot to OSU lately. The same thing happened against Kansas State a few games ago. K-State also boasts a nationally touted defense, and the Wildcats were able to use that plus 55-percent 3-point shooting to beat OSU by 18 in GIA. Although the Cowboys are getting hands up to contest a lot of the shots, opposing teams have been able to step into a lot of their shots. Is it because of fatigue? Probably, but it seems the golden ticket to stomping OSU this season is playing dominant defense because you’ll shoot about 50 percent on offense. Norense Odiase demolished Yor Anei on Wednesday night. Odiase, a redshirt senior, had eight points on 2-for-3, and was plus-25 in only 18 minutes. His counterpart, 6-10 freshman Anei, had zero points, four rebounds and fouled out at minus-25. There’s a lot Anei can learn from Tech’s veteran big. Here, Anei got caught on a wild block attempt, leaving Odiase free under the hoop. Anei has been much more disciplined as of late on defense, but Wednesday night he relapsed. On the Cowboys’ ensuing trip down the floor, Anei took a lazy dribble that not a lot of players would punish him for, but Odiase forced Anei into a turnover that resulted in a Red Raider 3. Entering Wednesday’s game, Lindy Waters averaged 33.5 minutes per. That would be tied for 28th in the NBA with Aaron Gordon, Jimmy Butler, Mike Conley and Jamal Murray. Sure, NBA players play an awful lot more games than college players, but that’s a wild stat to me. James Harden leads the league at 37.4 minutes a game. Waters and Cam McGriff have each passed that number four times this year. Like an ant on a warm summers day, the Cowboys were set afire after Tech put a magnifying glass over the Cowboys just not having the bodies to compete. 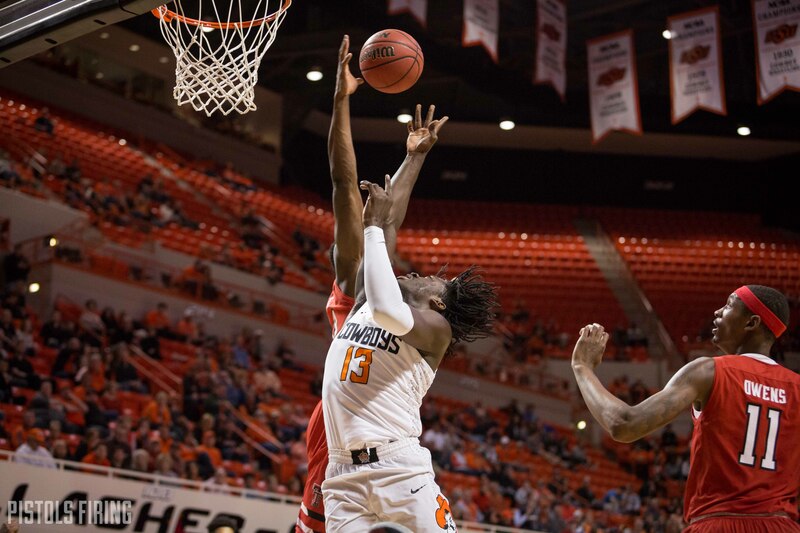 For a lot of games, the Pokes have found ways to stay competitive, but against Tech’s stingy defense and OSU’s 25-percent 3-point percentage, the Cowboys just never had a shot. It was a spark for the 100s of people left in GIA, a moment that would’ve been much more impactful had OSU been on the other side of the scoreboard, but that’s just where the Cowboys are at right now. The crew didn’t embarrass the team anymore than the scoreboard already did. All at minus-2, the newcomers all tied for the highest plus/minus on the team. Former team manager Tanner Taylor even got on the score sheet. On Saturday I wrote that though the Pokes were losing a lot of games, they were staying competitive. Wednesday was far from competitive. The loss is the second worst in GIA’s history, and worst since 1966 when OSU fell to Kansas 80-47. This year’s extraordinary circumstances have cast a lot of doubt. For much of this season, this year probably looks like a program nosedive to outsiders, and after Wednesday’s performance even some who follow the program might feel that way. Mike Boynton is a good basketball coach. I don’t know if that’s a hot take at this point, but I think it’s true. You don’t go into Allen Fieldhouse in your first try and win as a bad basketball coach. So, with that said, I don’t think anything ridiculous needs to happen. Will this season go down as a historically bad one in program history, almost definitely, but I think the last thing this program needs right now is to hit the reset button for the fourth time in five seasons.